We must have chocolate on the brain. 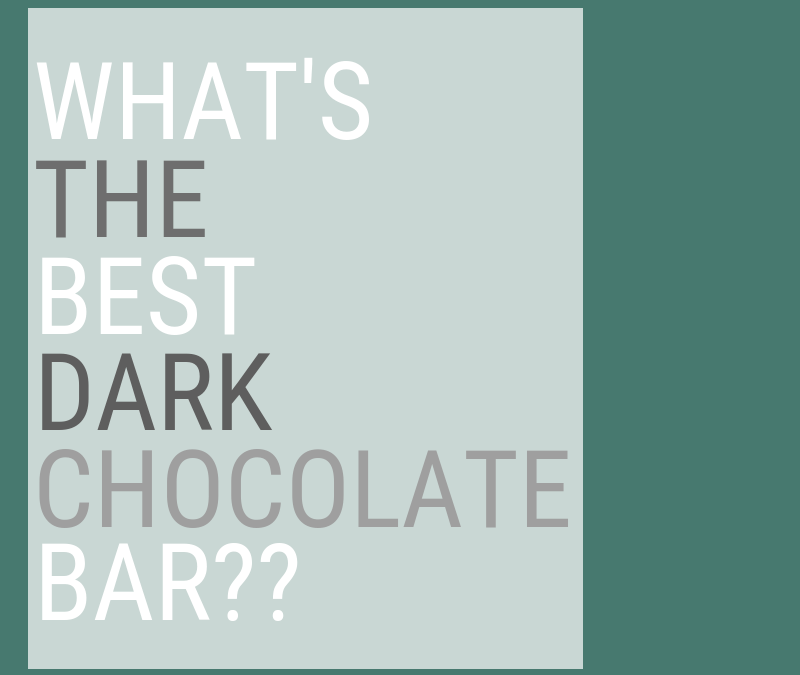 So, what is the best dark chocolate bar out there? Since last week’s post about the health benefits of dark chocolate, we have received quite a few questions about our favorite dark chocolate bars. So, today we are going to share our favorites with you. We understand that many of you might not have a local, gourmet chocolate shop (we certainly don’t), so we have included brands that are easy to find at most grocery stores or online. To make things more interesting, we did a blind taste test (with our kids) to find out which chocolate bar really is the best based on taste. Before you go running to the grocery store to start your own taste test, you must realize that not all chocolate is created equal. The bars that we have listed are definitely not the only great dark chocolate bars out there. However, we have screened them for the ingredients, and we like the way they taste, so that’s why we listed them. As you are browsing the chocolate aisle, make sure you check your labels. Ideally, you want to buy chocolate that is at least 70% cocoa or higher. Also, make sure that sugar is not listed first. Avoid chocolate that is “processed with alkali.” This process is called dutching, and while it reduces the bitterness of the chocolate, it also reduces the flavanols. Additives and emulsifiers such as carboxymethylcellulose, polysorbate-80, and soy lectin should also be avoided. Key words to look for include 100% organic, fair trade, non-GMO, and soy free. Remember, the fewer the ingredients, and the higher the cocoa or cacao content, the better. I have to throw in here that if you are looking for something different than just a chocolate bar, the Eating Evolved coconut butter cups are AMAZING! They contain organic coconut, organic cacao, organic coconut sugar, organic cacao butter, and sea salt. For me, they are the closest thing to a Reese’s that you will find with quality ingredients. If you are having friends over or just want to do your own taste test, we highly encourage you to do it. We had a great time with this, and our kids enjoyed it too. We grabbed a great bottle of red wine, some cheese, and then we separated the chocolate pieces into small bowls with a number on the bottom. After mixing them up, we couldn’t tell which was which. We all made notes after each piece. We narrowed it down, and then had to taste our top two again :). You know…you have to be sure. When it comes to the bars that we taste tested, they are all winners based on their ingredients. However, after a blind taste test, the winner is……..
Kenzie – Hu Simple Dark Chocolate – I loved this bar. It is sweet, creamy, smooth, and almost resembles milk chocolate. The Eating Evolved bar came in with a close second because I love a good sweet / salty combo. Josh – Mast Dark Chocolate – This won out for Josh immediately. It was sweet with a hint of fruit and very smooth. The Hu Simple Dark Chocolate was his second favorite. Kids – Blaise chose the Eating Evolved bar, and Paisley chose the Hu Simple Dark Chocolate. If you’ve got kids and want them to move from milk chocolate to dark chocolate, start around 70%. Both kids hated the Taza 95%. Obviously, the higher the cocoa content, the more bitter the taste. I actually really love the Theo 85% dark bar on it’s own, but the bitterness really came out after eating the bars that were 70% or 73%. The Taza bar is for the brave, bitter chocolate lover. The texture takes some getting used to, but paired with the right wine, it can be a good choice. Plus, you will probably only be able to eat one square. We hope you find a new chocolate bar to love through this post. Find your favorite and go with it!